The BAE Systems Australia Patria AMV35 and the Rheinmetall Boxer CRV at Defence Establishment Fairbairn as part of The Army’s Land 400 Phase 2 project in Canberra for air transportability trials. Image via Commonwealth of Australia, Department of Defence. The fixation on job creation through Defence projects is “crowding out” much-needed discussion around cost, risk and schedule, head of public affairs for Raytheon Australia Gerard Wheeler has told a parliamentary hearing. Speaking at the inquiry into the benefits and risks of a Bipartisan Australian Defence Agreement, Wheeler strongly encouraged individual members and senators to take advantage of defence Senate estimates and parliamentary inquiries to better inform themselves about Australia's defence capability needs. Wheeler lamented the current discussions are solely focusing on economic activity for individual states looking to become the base site for major acquisition projects. "I think the current discussion about the Future Submarine, the Future Frigate and LAND 400 are examples where members of Parliament should be openly having a public discussion about capability, cost, risk and schedule," he said. "Instead, the only discussion is about economic activity. That may be very important, and it is, but that is crowding out the public discussion about what sort of defence capability the ADF is going to get. I think that is a very bad thing." Wheeler said the discussion being driven by politicians and the media is generating unrealistic expectations for job growth and economic improvements, particularly in the case of LAND 400, where Queensland and Victoria are furiously lobbying to secure the project, and is severely lacking in critical discussion around protection for ADF personnel. "What it's led to is peddling in false hope – that Defence projects will generate thousands and thousands of new jobs. I think we have to be realistic about the number of jobs that some of these projects will be creating. LAND 400 is a very good example," Wheeler said. "You have one state saying that it will generate 450 jobs and a billion dollars worth of economic activity. Another state is saying it will generate thousands of jobs and $5 billion worth of economic activity. For the same project, generating the same number of 225 combat reconnaissance vehicles, how does that work? I just don't think there's a proper examination of these issues and there certainly isn't a proper public discussion about the capabilities that the ADF is going to get through that project. The protection of our service men and women are the sorts of issues that we should be talking about rather than how many jobs a certain project is going to create." The LAND 400 Phase 2 project, estimated to be worth up to $5 billion, has heated up in the last few weeks, with accusations rife that the project will come down to pork-barrelling in marginal seats. Federal ministers Alan Tudge, Tim Wilson, Chris Crewther, Michael Sukkar, Kevin Andrews and senator Jane Hume converged on RUAG Australia's office at Bayswater for the announcement that, should BAE Systems secure the project, RUAG Australia will produce world-leading ballistic armour for the 225 Australian Army combat reconnaissance vehicles. 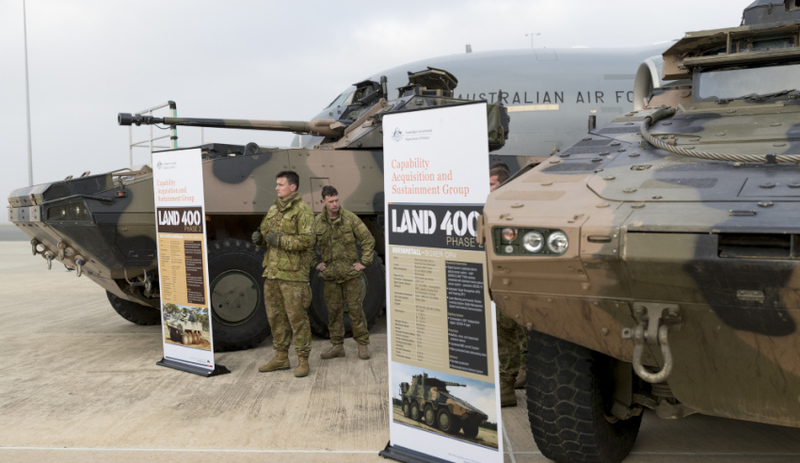 A new campaign by the state's Labor government was also launched recently, which includes billboards throughout Canberra aiming to promote the strengths of Victoria’s defence industry and record in manufacturing military vehicles. Defence's discussion of job creation in media releases from the defence and defence industry ministers has been put under the microscope recently at Senate estimates, with Australian Greens senator Peter Whish-Wilson calling for documentation and evidence of jobs set to be created with defence companies under the new Defence Export Strategy.